The original detainees included Hameed Darweesh, a green card holder from Iraq who worked for the U.S. military for 10 years as a translator. Darweesh and his family were detained around 6 o’clock on Friday night while returning to the United States; his family members were released shortly thereafter, but Darweesh was held until just after noon on Saturday. 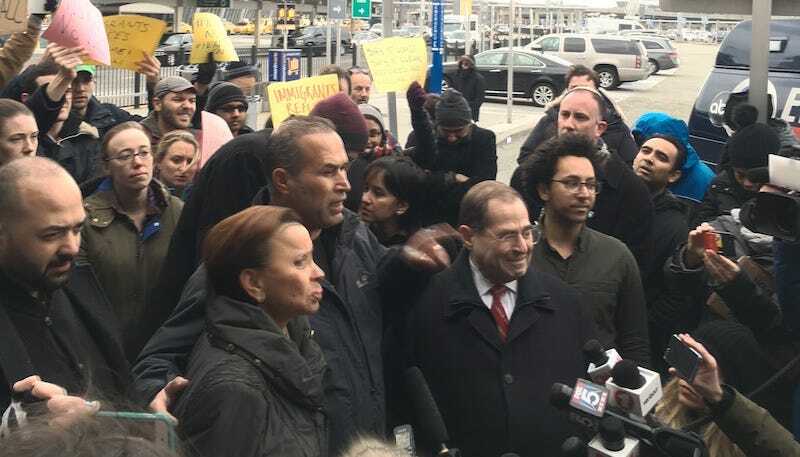 Activists and protesters greeted him with chants of “No hate, no fear, refugees are welcome here.” Standing outside the terminal, Darweesh addressed the media flanked by Rep. Jerry Nadler and Congresswoman Nydia Velazquez. Members of the media were initially not permitted to enter the terminal where the detainees were being held, and Port Authority police and New York State troopers gathered to prevent reporters and protesters from gaining access. A large, armored truck was also parked outside the arrivals entrance. At least ten people were still detained as Darweesh got into a car and returned to his family, representatives from the New York Immigration Coalition, which filed a lawsuit on Darweesh’s behalf, said. Only one, Haider Sameer Abdulkhaleq Alshawi, had legal representation as of Saturday afternoon. Alshawi’s wife worked for an American contractor in Iraq; she lives in Houston. A Homeland Security official, flanked by heavily armed law enforcement officers, spoke to Alshawi’s lawyers on Saturday evening. “There’s a lot of people involved,” she said twice in response to questions. “We’re waiting for guidance from headquarters,” she also said, twice. Becca Heller, an attorney with IRAP, said that CBP agents have said that detainees cannot be released without the approval of both the Secretary of State and Secretary of Homeland Security. “One of those doesn’t exist right now,” she noted. Planes continued to land on Saturday, and the number of detainees at JFK and around the country continued to grow. UPDATE, 7:30 pm – Haider Alshawi has been released from detention. Speaking to reporters through a translator, Alshawi recounted his experience. Customs and Border Patrol officials made sure to let him know that he had enough money to pay for his own ticket back to Baghdad. If he’d been forced to return, he said, “I would need to check under my car for bombs every day.” Even if your car hasn’t been rigged, the car next to you at a stop light might have been. In Baghdad, if you’re two hours late for something, people think you’re dead. Asked whether he still wants to live here, in the United States, Haider said yes. “Less dangerous,” he added. He declined, with a laugh, to say what he might tell President Trump, given the opportunity. He wished other detainees around the country good luck. “I’m going to hug my family for a very long time,” he said. He hasn’t seen his wife and daughter in three years.